Rome and Milan hosted economic forums aimed at introducing Iran’s trade potential and opportunities to Italian entrepreneurs and companies in the post-sanctions era on October 28 and 30. The forums were sponsored by the Italian committee of the International Chamber of Commerce and the commerce chambers of the two countries. Underlying the importance of such gatherings, Mohammad Mehdi Behkish, secretary-general of ICC’s Iranian committee, said such forums indicate the willingness of the European country to expand its relations with Iran. “Iran is also eager to tap into this opportunity [the forum] since Italy has a good status in Iran’s industry,” he said. Behkish emphasized that the Italian committee is more than willing to resume engagement in the Iranian market. ‘Italy seeks to regain its pre-sanctions status in the Iranian economy, as it enjoyed close economic relations with Iran in petrochemical, steel, power, textile and packaging sectors before the sanctions,’ he said. Maria Beatrice Deli, secretary-general of ICC’s Italy committee, expressed satisfaction over the economic meetings and said many Italian firms who attended the forums have been active in Iran for years and other participants are seeking commercial opportunities in Iran. “The forums primarily targeted Italian entrepreneurs and mark the beginning of our cooperation. We hope they had helped Italian companies identify trade opportunities in Iran,” she said. Carlo Calenda, Italy’s deputy minister of economic development, plans to visit Iran in late November. Representatives of Italy’s Ministry of Economic Development, Italian Institute for Foreign Trade (ICE), the European country’s industrial and banking unions and commerce chambers union will accompany the minister on the economic mission. Earlier in August, Italy’s Foreign Minister Paolo Gentiloni and Economic Development Minister Federica Guidi visited Iran at the head of a high-ranking trade delegation from the European country and met with Iranian senior officials, including Foreign Minister Mohammad Javad Zarif and Minister of Industries, Mining and Trade Mohammad Reza Nematzadeh during their two-day trip. Representatives and senior managers from the state-run credit insurance company SACE–the Italian Exhibition and Trade Fair Association and the General Confederation of Italian Industry, as well as companies active in power generation, highway construction, banking, car manufacturing, medicine, water, energy, oil, gas and petrochemical sectors were also part of the Italian delegation. “Italy will definitely try to regain its pre-sanctions position in the Iranian economy, as it enjoys close economic and cultural relations with Iran,” Gentiloni said during the visit. 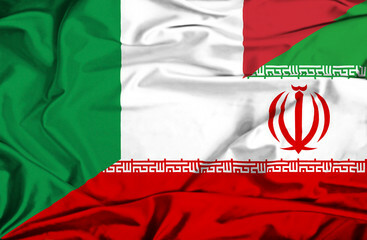 Italy had strong economic and trade relations with Iran and was Iran’s top trading partner in the European Union before the sanctions. But trade between the two countries dropped from €7 billion in 2011 to only slightly above €1 billion, according to Guidi. ‘Italy is hoping to resume economic activities in Iran with the prospect of sanctions being lifted from 2016,’ she said in an interview with IRNA prior to the visit.